Those of you following this blog know I love beets. I always have, but this deadly serious vegetable is starting to push my beet-loving boundaries. Last spring I decided that planting my own small garden would be a great complement to my Grant Farms “small” CSA share. One quick blink later, I’m overwhelmed by beets, radishes and everything green. I am was determined to eat all most of what I find in my veggie box and what I’ve grown in my garden. But I must admit, my late-spring exuberance is being overcome by roots, stems, leaves and bulbs. I’m still up for the challenge, but beware – my recipe development is showing the strain. Preheat oven to 350 degrees. Melt coconut oil — I put it in a heat-proof bowl and stick it in the oven for a couple of minutes as the oven is preheating (it only takes a minute or so). Blend together oil, eggs, vanilla and maple syrup. Add beets and mix well. In a medium sized bowl, stir together flour mix and cocoa powder. Add to wet ingredients and blend well. Spoon into greased or paper-lined muffin cups, 2/3rds full and bake for 18 to 22 minutes depending on your oven and your flour blend (gluten-free baked goods usually take a little longer; I baked these cupcakes for the full 22 minutes). These dark chocolate, ruby red treats are delicious! Seriously good and no one would guess they’re made from beets. * For more information on baking with gluten-free flours or how to substitute regular flour in this recipe, please check here. 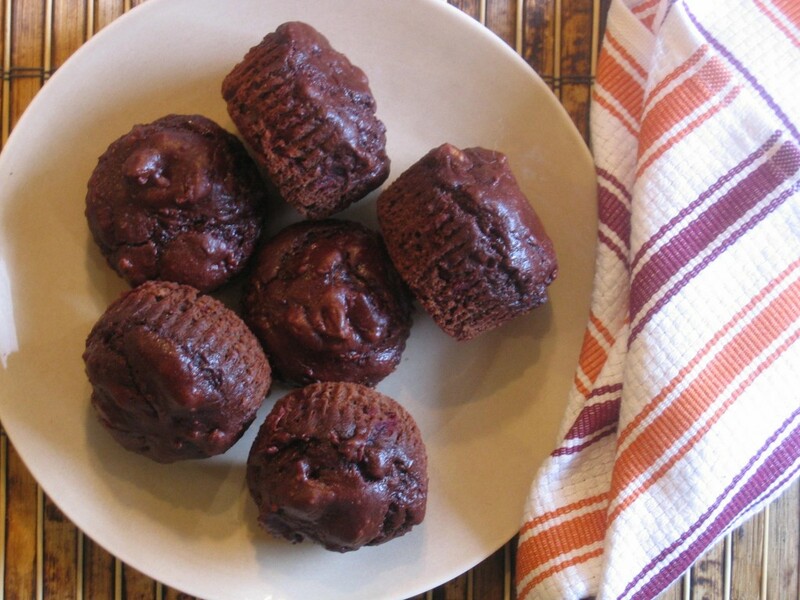 * I’ve made these cupcakes with raw, grated beets and with roasted, puréed beets. I like the depth and moistness of the roasted version, but either way works fine. This entry was posted on Thursday, July 9th, 2009 at 6:27 am	and is filed under Gluten-Free Recipes, Seasonal Foods. You can follow any responses to this entry through the RSS 2.0 feed. You can leave a response, or trackback from your own site. WOW!!!!! Beautiful! Every time I check your blog recently, your recipes blow me away….. I love all of the beet recipes and the rhubarb ice cream. Such rich and beautiful colors. Thank you for sharing your beet recipes. This is my first year with a CSA and I have lots of beets. We never really eat them so I wasn’t sure what I was going to do with them. Thanks! Thanks, I really appreciate your comments! Yes, when you use beets, everything ends up being a beautiful color — even your teeth! Oh my gosh — you and Shirley are the beet virgins. We have to change that. I’ll post a couple more beet recipes. They are so incredibly versatile, but people just aren’t used to using them. They go with everything, including on sandwiches! Seriously. This is a great use for beets if I ever saw one. I’ve always avoiding making red velvet cake (since the idea of plugging a cake full of that much red dye is a little bit repugnant); however, I could see beets as a stand-in. Very lovely, Melissa. Did they taste as good as they look? Melissa, I am in awe that you can develop recipes. I can only follow recipes; I can’t imagine I could ever develop one. How about giving some thought to setting up a yahoo group for Grant Farms CSA members to share recipes. I have never before had kohlrabi, so this is a real challenge to me. Thanks for a great, useful blog. Yes, using real coloring for a deep red cake is much more fun. Plus, it tastes good. Honestly, Lo, these things taste great. I can only imagine how yummy they’d be with frosting. Mmmm. Did you see my suggestions to you about the kohlrabi? Back a post or two ago — you can shred raw kohlrabi into salads. You can saute it or stir fry it with other veggies. Chop it up and put it into tuna salad. Treat it like you would a carrot or radish. I’m going to do a kale soup post and add a few more ideas for beets. I got a ton in my last box. Luckily I like them! I’m going to be out of town for 4 or 5 days, so you’ll have to let me know what’s in the delivery box next week. I’m giving my share to a friend who has never belonged to a CSA. Hopefully she’ll be able to deal with all the veggies! Do you know about using Facebook to share recipes at Grant Farms? That’s starting to develop right now. Check that out. These cupcakes look killer I appreciate your teaching us how to turn our veggies into sweets! I’m in the same position with my CSA share right now – determined to waste nothing. Instead of beets, I have been overwhelmed with rhubarb! beets and chocolate is a classic – they look so moist! I use beets to colour ice-cream pink too and nobody ever made a face. Are you referring to the Grant Farms CSA group on Facebook or is there another page I’m missing? There isn’t much at all happening on the Facebook group, unfortunately. I’ve posted on there a few times, but it seems there are only a handful of people in the group (of over a hundred people) that are actually participating! I agree with Mary, though, I think we need a group somewhere – I feel like we’ve hijacked your blog!! Maybe a Yahoo group would be better than a Facebook group? Or maybe a new Facebook group that could be a CSA recipe share, not necessarily specific to Grant Farms? Tea and a bun… as we say here in the UK… nothing quite like it either mid morning or mid afternoon (or early and mid evening as well for that matter ). One thing I can confirm is that beet juice turns a sort of orangey colour in macaron but works very well in marshmallow mixtures, where it stays pink. I don’t like using chemical food colours and am constantly looking for natural alternatives. These beat those red velvet cupcakes back in the day for sure! Lovely, Melissa … I will (how can I say this nicely?) give up my vow of beet abstinence for these cupcakes!! I’m not real familiar with Facebook, but I like Yahoo groups because you can post individual messages. Would be great for a recipes group. And I like Rayann’s idea for a CSA group. Beets are already so sweet that adding chocolate seems like a “given” to me. Sugar comes from beets, so beets are a total girlie vegetable. Dark pink and sweet. What more could you ask for in a veggie?! Rhubarb or beets? Hmmm, I don’t know which I’d pick. Probably the beets. Enjoy it now, because the rhubarb will be gone before you know it. Well, you’re an artsy girl, so I’m not at all surprised that you’ve been using beet juice as dye. Much better than that carmine stuff they get from dead insects. Check out the label on Hostess pink snowballs — yep, carmine (crushed up insects — eewwww). I’d rather use beet juice. Yes, it’s a grab bag on the CSA boxes. I had several batches of beets, but no rhubarb. Actually, that’s what I love about belonging to a CSA — it’s a mystery each week. Even if your friend emails and tells you she got such-and-such, that doesn’t mean you will. And that’s what makes life fun — surprises! I’m not kidding, these cupcakes are tasty. Mmmm! I’ll keep posting CSA recipes throughout the growing season and we can discuss tips, ideas, etc., but I think they’re also trying to get the Grant Farms Facebook group going. It doesn’t seem like that many people know about it. Maybe it will grow as the word gets out. In the meantime, we’ll just keep on playing with our food! What do you do with marshmallowy mixtures? Oh, I love macaroons and like I’ve mentioned before, I do plan to try your recipe one of these days. As soon as I dig myself out from under this this pile of kale and beets. Hmmm, so coconut and beet juice? I wonder, wonder, wonder. Boy, I sure wish you were closer, we could have a good time as kitchen chemists. Don’t you think? You bring the Pimm’s, I’ll supply the beet juice. Can we do Pimm’s and pink buns? I knew I could win you over! Like I said, you’re such a girl — all it took was some chocolate. Now we have to figure out how to get you on the kohlrabi bandwagon. I’m not sure how Yahoo groups work, but Ning also has a group option. But hardly anyone even knows what Ning is, so that’s probably not a good idea. In the meantime, eat those greens! Do you feel comfortable starting/moderating a Yahoo group? If not, I don’t mind doing so, but it will be next week before I can get to it – we’re taking our 2 year old up to Denver (from the Springs) for the weekend, and I’m going to ignore the computer for a few days. If you’d like to get it started, invite me at rayannlund@yahoo.com – I know quite a few people that are CSA members that would join up. If you’d rather not take it on yourself, though, no worries, and I can get it up and running next week. See, Melissa, we’re hijacking your blog again. Sorry. This was my whole intention for CSA season (to post recipes for the harvest) and I don’t mind discussions going on in the comments at all. I agree that a “group” might be more efficient, but I think that’s what Grant Farms is trying to do with the Facebook thing. If you look on the “Notes” tab or the “Discussion” tab, there are some recipe conversations going on. Whatever we can do to help spread the kale and beet joy! I’m off to Idaho for a few days to camp, hike, mountain bike and get a good dose of nature! I’ll resume posting Thursday or Friday. Stay tuned and have fun playing with your food! I made the beet cupcakes today. They are so good. No frosting is necessary, since they are so YUMMY. thanks for the great receipe. I’m glad you tried the recipe and liked it! It’s a fun recipe as people can’t believe there are beets in the cupcakes. Sneaky, heh!? It’s a small world after all. I have my beets from Grant Farms this week that I need to use. I know it will be a bad day at work tomorrow so I am making these to take to work. I loved these on July 17, 2009. Good recipes are timeless.